I'm starting to like Air Kami more and more. They seem to avoid acting like dicks. 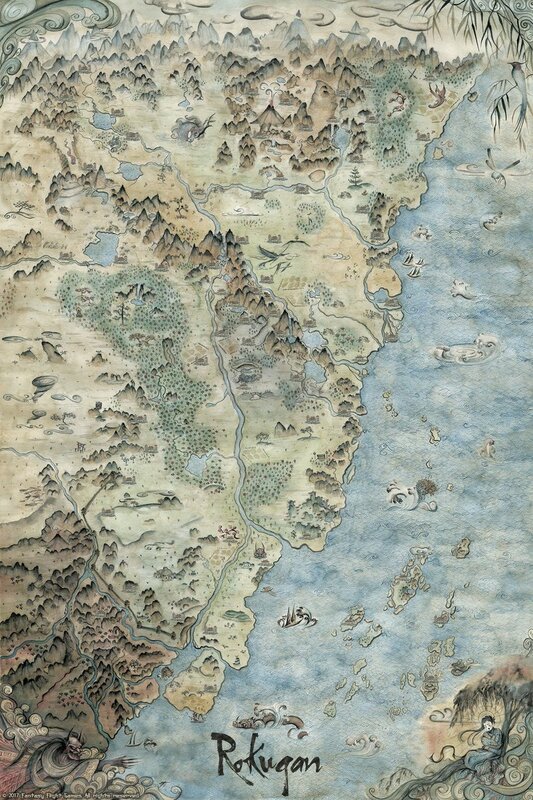 As I said on the L5R FB group, I'm a geologist by background, so I cringe every time I see a map of a fantasy world--with VERY few exceptions, they're all drawn to a) support the accompanying story's narrative and b) look pretty. There's almost no attempt made to have them make geological or geographical sense. That said, I don't really let it bother me; in the end, the map is just a convenient way of portraying where stuff is happening. And, to be fair, few writers have the background in geology, geomorphology, hydrogeology, etc. that would allow them to have things make sense. I rationalize it by saying to myself, eh, as long as the story is a good read, and accepting the fact that people in said story can read minds, make things burst into flames, shoot beams of freezing cold, etc. I can put up with imperfect maps. I suppose all is relative. The fact that you don't need to be a geologist to find that map nonsense should say it all. It's a bit like watching a Hollywood film about ancient Rome or spaceship fight with a historian or a physicist/engineer, where you won't see anything wrong but your friend can point out at least ten issues of the top of his head. Instead that map is a bit like watching Gladiator and seeing an iPad, a laser weapon, or a grenade: even non-expert will cringe at that. This is not usually something clever to bring out as an explanation I agree. But since we are in a fantasy setting, people should not expect the same rules from our world to apply. Pointing out what in the end are details without impact on the plot and narrative is not constructive and pointless to my opinion and deserves the "it's magic" universal answer. Using this however for resolving a plot whole in the narrative is bad storytelling and lazy (and it's total different matter). Saying "it's the kami" to cover a whole is bad: not only it strains the sense of disbelief and gives some difficulty to the GM/storywriter, but it makes it hard for the player/audience to follow and interact with the world. Most storytellers strive for consistency because only then can the audience immerse themselves in the story, and start imagining what something may mean for the future: if nothing makes sense, foreshadowing will fall flat and you won't be able to build tension and suspense (just think of all the tropes used in thriller/horrors, for example). And as a player I won't be able to interact with this world since I can't make sense of it: can I follow a river upstream? Is it advantageous to fight from a hill? Can my army siege a castle up in the mountain, or is there a huge lake and a river flowing towards it? I agree with @Kinzen: this was a missed opportunity to fix the map. If my memory of the O5R map still serves, that lake is on what would have been the Phoenix/Dragon Clan border, so I'd say it's pretty close to Phoenix lands. Is that so? I thought the Dragons were in the NW and the Phoenix in the NE, but your explanation seems more coherent with the map. So basically that big volcano in the centre-north is the one in the Wrath of the Kami card, and it's smack in the middle of Dragon-land? And so the plain to the NW with the Kirin symbol are actually Unicorn land? I thought the Unicorn where to the West, beyond the mountains, more or less where the tree picture is in the map. Older map (with place names) Colours of settlements line up to clan ownership. Dragon is basically centre-north around that 'blob' of mountains. Is it possible to buy the digital form of this? I have access to my own large format printers so I dont need a print but I am more than happy to pay for the art. I'm not the artist, Fʀᴀɴᴄᴇsᴄᴀ Bᴀᴇʀᴀʟᴅ. You could ask her over at francescabaerald.com. 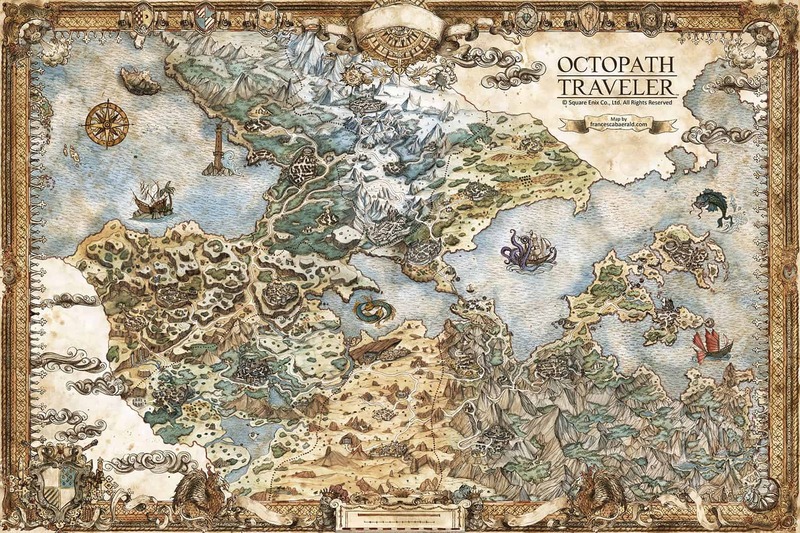 She also did the map for my new favorite video game, Octopath Traveler. I would suggest contacting her directly, or going to her store at https://www.inprnt.com/gallery/francescabaerald/legend-of-the-five-rings-map-of-rokugan/. Here is a quickly cobbled together image of where I understand the various clan boundaries to be based on previous incarnations and using natural landmarks to mark out the boundaries. I am sure the boundaries are not 100% correct. After all, first-- the boundaries are kind of understood to be kind of murky to begin with and don't completely run up against one another neatly like this. And, in fact there are some minor clans that live between some of these clans and this doesn't account for any of that. So, really, none of these territories are as big as they look when displayed like this. The area with the 5 rings isn't claimed by any clan as far as I understand, although I know there are a number of minor clans that live over there, but that really seems to be kind of unclaimed wild there, such a large area didn't seem to be accounted for any previous version of the map I could find. This is mainly because the Shinomen forest here seems to be a wildly different shape than in previous versions of the map. The Spider Clan symbol is just the Shadowlands. But, if you want to generally know where the different clans are located, it is at least a slight upgrade over the original map. I'm curious, what's up with the big piece of 'unclaimed' land in the west? Is there an Imperial Edict that says that no clan shall own that land? Wouldn't it be constantly vied for? It probably has a lot to do with the fact that the Shinomen forest is a dangerous place full of ghosts and such. So no clan really tries to claim it. So that's why the Scorpion don't try to expand further south. The Crab are kind of focused on protecting against the Shadowlands, so they don't try to expand any further north as doing so would mean diverting forces away from their defense. And while the Unicorn could try to claim it, it is likely they are spread kind of thin as it already is and they are under almost constant threat of the Lion trying to take what lands they have again. So it is possible that just naturally no Great Clan whose lands border on that area are able to expand into that area. But, if they ever decide to add a 10th Kami into the setting and give him is own clan, they have a nice area right there for his clan to claim. Looks good. Certainly it's 'good enough for government work'. The only bit I'm not sure about in the new background big enough to actually matter is how far the Lion boundary goes west. Chrysanthemum Petal Lake is the lake immediately to the south of that 'spur' of lion territory to the west. The loop of mountains to the north of it contains (or contained) Shiro Ide and Shiro Iuchi, both of which are Unicorn families. Honestly, I made the map without the help of the core rulebook which I just got today. There are several minor adjustments that I would make now that I got my rulebook today. For instance, that southern section of what I made Imperial territory is actually home of several key locations for the Crane while their territory doesn't extend all the way south like I made it. But, I also noticed the Unicorn/Lion problem and the Scorpion/Crane border is quite questionable. The only part that I have good confidence in is the Phoenix as their territory is neatly outlined with rivers, roads and mountains. But, I made it in a hurry-- the point is really to better illustrate where the different clans are and who is next to whom and thus kind of get a picture of what relationships are most important for the various clans. The Shinomen is something people generally stay away from. At least part of that is the Plains Above Evil. And as far as i know, the spider later has some hidden hideouts in the shinomen mori. But the also not dare to venture forth into the east. Maybe it is because of the naga, sleeping or still roaming the shinomen and some of the lands east. So the differences between the old and the new map (or rather, the Atlas of Rokugan late 4e version) are minor, except for 2 things I can spot: Dragon Mountains have wandered to the east a little, being one larger mountain range instead of 2 parts as on the old maps, and there is now a suspiciously large river running along the Kaiu Wall (or nearby, at any rate), that simply did not exist before. Which makes me wonder why it was put there. Any other major differences? I am about to start a L5R RPG campaign, and contemplate using the Atlas of Rokugan from 4e, but I prefer playing strictly canonical. ...and there is now a suspiciously large river running along the Kaiu Wall (or nearby, at any rate), that simply did not exist before. That river is probably meant to be the River of the Last Stand. It has always been there, in the lore...it's this river's waters that, in the early Eighth Century, the shugenja Kuni Osaku caused to rise a massive flood for 80-ish days, holding back the armies of the oni lord known as The Maw while the Crab constructed the first segments of the Kai Kabe, the Carpenter Wall, behind it. When Kuni Osaku finally died performing this ritual and the waters receded, The Maw's horde found itself unable to break through the new Wall. In what became known as the Battle of the Cresting Wave, the Crab counterattacked, killing The Maw, scattering its armies and preventing the Empire from potentially being overrun and destroyed. All this is to say that this lore was established long ago, so the River of the Last Stand has always been there...it just hasn't been portrayed so prominently on a map before (that I can recall, anyway). It is absolutely true that it was always there...but it does also present something of a conundrum. A lot of stories and RPG Adventures have Hida Joe and Hiruma Susan venturing forth from the Kaiu Wall and its various traps and snares, and then wandering directly off into the Shadowlands. No mention of a river crossing. And at this point, there have been countless pictures of oni coming right up to the wall with goblins, etc, in all kinds of battles without the aid of boats. At the time of the Battle of the Standing Wave, the River was fairly wide...not huge, but more than a creek. It required at least boards or large bodies to cross, which the oni had in plenty and could have easily gotten past save for Osaku's heroic efforts. However, after the battle was over, the flooding receded to its usual size. Over the centuries, the river has become so clogged with the remains of old siege equipment the ashes and bones an otherwise broken remains of the dead (human and oni), and other things that the Shadowlands have shoved into the river to get across to assault the wall that, while a river on the map, it barely qualifies as such to those bushi seeking to cross outwards on it. The first 100 yards away from the wall is broken, shattered, an often very muddy terrain with treacherous holes around which water weaves and pools, but it is not a river as an obstacle as such. My idea anyway. We'll see if Shadowlands says differently. In what became known as the Battle of the Cresting Wave, the Crab counterattacked, killing The Maw, scattering its armies and preventing the Empire from potentially being overrun and destroyed. Let's not forget taking The Maw's skull and mounting it over the gates of Hida castle. I have always liked that part of the story, the Crab saying to attacking oni hordes something like "hey tough guy, you think you are so mean? We have killed far, far bigger and meaner than you and use their head as a door ornament. You are nothing and will be defeated like you are nothing."